Robert Shinn, affectionately known as the "band kid" by the UA marching band, helps conduct the group at halftime of the football game on Oct. 23. Shinn has been a part of the Pride of Arizona Marching Band tradition for 11 years. Affectionately known as the "band kid" by UA Pride of Arizona marching band members and staff, Tucson resident Robert Shinn celebrates his 27th birthday today. 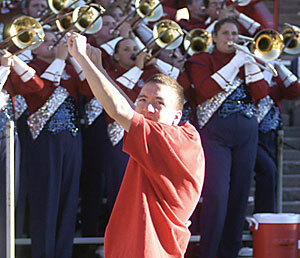 Shinn's birthday also marks the anniversary of his involvement with the marching band that began at Homecoming 11 years ago, despite his being mentally challenged. Since then, Shinn has helped conduct the band at every home football game and has attended almost every band rehearsal, which has become an activity he feels has been the most fun in his life. At tomorrow's Homecoming game, he'll be standing on a podium in front of the marching band, sporting a UA T-shirt and mimicking the hand movements of Scott Matlick, music senior and Pride of Arizona drum major. Although Shinn said learning how to conduct the band was easy, his mother, Debbie Shinn, said her son has faced tough obstacles from the moment he was born, and has been a living success story ever since. His story begins in Silver City, N.M. in 1977, when Debbie Shinn found out she was pregnant. Once in the examining room, her doctor miscalculated the length of her pregnancy by two months, expecting the child to be born in October when he should have been delivered in December. When October came around and Debbie Shinn had not yet given birth, her doctor induced labor and Robert Shinn was born almost nine weeks premature, weighing approximately two pounds. Debbie Shinn said Robert had trouble breathing on his own and remained in newborn intensive care for nine weeks, suffering from three episodes of cardiac arrest during that time. His heart problems resulted in a lack of oxygen in his brain, causing extensive brain damage from which he would never recover. "If he would have termed, he would have been fine," Debbie Shinn said. Instead, Robert Shinn was labeled mentally challenged resulting not from a birth defect, but medical malpractice. Sixteen years later, the Shinn family moved to Tucson and Robert Shinn enrolled in a high school for the learning-disabled. On the weekends, the family would go to UA football games and Robert Shinn would find the closest seat to the band members. After seeing how much Robert Shinn enjoyed the music, Debbie Shinn took it upon herself to find a place for him in the band. She asked former Pride of Arizona band director Hank Feldman if Robert Shinn could go to band rehearsals and help, and after taking one look at him, Feldman said yes. "He introduced Robert to the band and they all clapped and welcomed him," Debbie Shinn said. "Since then, all of the assistants who come and go embrace him and the members high-five him." Jay Rees, director of the Pride of Arizona band and associate director of bands, said in the past 11 years, Robert Shinn has become very connected to the band in a way that benefits both Robert Shinn and the band members. "It's very official," Rees said. "He feels like he's really contributing, and he is. The band takes tremendous pride in the fact that we're able to have that impact in Robert's life." Rees said having Robert Shinn help the band is a win-win situation. Creating such an impact in his life makes the band members and staff feel like they're doing more than just playing another fight song at a football game. In addition, Robert Shinn's joyful spirit is in abundance, which is encouraging and contagious for the band members, Rees said. "He's wonderful and always very excited," said Debbie Lewis, molecular and cellular biology senior and cymbal section leader. "He's probably one of our best fans." Kristina Koenig, undeclared sophomore and percussionist, said Robert Shinn's presence with the band is constant and she can't remember the last time he wasn't at a practice or game. "He's a real sweetheart and he's been with us constantly," Koenig said. "He has a lot of school spirit and is obsessed with the band." Robert Shinn's enthusiasm has not only been an inspiration for the band, but also for community members like the Jim Click family, owners of several automotive dealerships in the Tucson area and friends of the Shinn family. Debbie Shinn said she was standing by the bed of James "Boompa" Click Sr. when he passed away almost two years ago. Shortly before he died, Debbie Shinn said "Boompa" whispered to his son James Click Jr., "Jimmy, I want Robert to have his own podium, you hear me?" "Who knows why this was on his mind, but two weeks later Jim called me up and said for me to buy a podium and that he would reimburse the band," Debbie Shinn said. Instead of buying a new podium, Debbie Shinn said she called the music department to recruit volunteers to build one for $200. After the podium was finished, Click donated $1,000 to the Pride of Arizona for constructing the blue metal podium, with a label reading "the band kid." Rees said in the beginning of each year, the "band kid" is introduced to new members and graduate students interested in conducting. "I tell them he's probably a better conductor than they are," Rees joked. "But the reality is, he's excellent. He has our style down and he's clean and clear with conducting patterns." Rees said Robert Shinn picked up his conducting skills relatively quickly, from watching the conductor's hand motions at every practice and from his personal association with music. Rees said music therapy is believed to be very powerful and therapeutic in healing, and said that could be why Robert Shinn picked it up so easily. "Although he's mentally challenged, music speaks to him deeply," Rees said. "He feels the music on a level that is not intellectual, and it's not supposed to be, otherwise it wouldn't be an art." In addition to his help in conducting the band, Debbie Shinn said Robert Shinn sings in church choir and holds a full-time packaging job at Thirsty Stone Resources, a Tucson sandstone coaster retail company. However, Robert Shinn said directing the band is his favorite activity because he loves the music and excitement at football games. "It's very exciting to hear them play," Robert Shinn said. "The music makes me want to dance, but I'm too shy." Robert Shinn said from working with the band for so long, he developed relationships with many band members and staff. "I want to keep working with them for as long as I can," Robert Shinn said. "They are friends and special people. They really care about me and it feels good." Debbie Shinn said Robert Shinn's involvement with the band has given him a real sense of importance and has boosted his self-esteem, but his outstanding sense of happiness and positive focus on life is what makes his story a success. "He focuses on anything positive," Debbie Shinn said. "If there is anything on TV that involves clapping, he wants to be there, helping them clap. My pride comes from watching how well he's handled his situation."